If you are reading this you are probably a cryptomaniac just as me. So I’m not going to tell you how crypto is already changing the world. What we do however need to talk about is how can we make crypto easier for others to use. We want to be able to walk into a coffee shop, order a triple espresso, and simply tweet the money directly to the register. Sending and accepting cryptocurrencies should be super easy. That is why we have created @YoTwallet — Your User Friendly Crypto Wallet — to spark some ideas. Thanks to YoTwallet anyone with a Twitter handle can already accept ether! The receiving part will automatically get a centralized account created. Yes, you heard me. Accounts are centralized, we hold the keys. This is not great. But hey this is for fun and to showcase the Blockie tech. Just to be clear, as for now @YoTwallet is running on a private Ethereum net and all crypto is just to play with (you can not exchange it for anything). “@YoTwallet send 10 eth to @youralias #yolo” and then ether is in the air, coming your way. @YoTwallet what is my balance? You can send “wei”, “ether” or “eth”. Well, since YoTwallet is a bot, Twitter can at anytime mute it if it finds it looking suspicious. A solution might be to implement private messaging. It is tempting to release YoTwallet on the Ethereum mainnet so you can send real ether. Buuuut, that would mean we have to ramp up the security a lot if we are to hold users private keys. We don’t have any real plans on doing this. We might release it on the public testnet, if enough people would want it. YoTwallet is built using the Blockie tech. 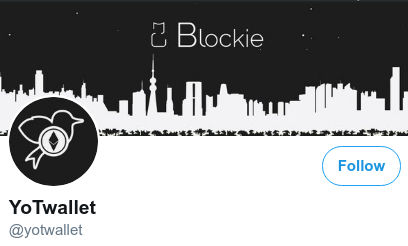 We have used Space.sh (Blockie’s open source tool to create server apps and for automation) to create a Twitter API module and a module called YoTwallet. These modules run in Things we created using Things.ai (reusable building blocks for creating services), and they are deployed to servers using Machines.sh (create private clouds on many host providers using one specification). All these tools are open source. Things and Machines will be fully released soon. We are also building The Blockie Open Market (BOM) which will be a portal where users can collaborate in building Things together which can be connected to/controlled by smart contracts. Interesting trivia is that the Twitter API module and the YoTwallet module are both written in Bash. You don’t have to write your code in Bash when using our tech, you can use any language of choice which runs in containers. 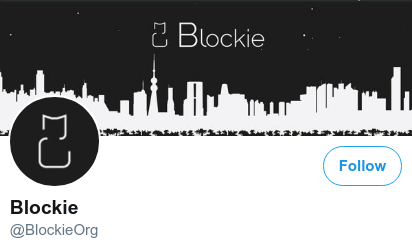 Follow @BlockieOrg on Twitter for even more blockchain and Ethereum related tools we are releasing in the coming weeks! @YoTwallet — Tweet Ether was originally published in Superblocks on Medium, where people are continuing the conversation by highlighting and responding to this story.